In every trip there is always something we wish we had done differently. This time we wished we had given more time to Dresden. Much of Dresden was destroyed during World War II but its historic baroque architecture has been beautifully restored. Dresden has a wealth of museums to rival Berlin’s and deserves a week rather than the two days we gave it. If we ever get back to Dresden, we’ll try to stay in the same charming, centrally located hotel, Buelow Residenz. It's connected to its far more expensive sister hotel the Buelow Palace which housed a 2 star Michelin restaurant and much less expensive but quite good bistro. One consequence of widening income inequality is that the Michelin star restaurants have become much more expensive than the average restaurant. When we travelled a lot in France during our working years we usually managed to fit in one Michelin star restaurant. Now we don’t even try. I also recommend Restaurant Daniel, a kind of German equivalent of French Nouvelle Cuisine—much lighter than traditional German fare with an emphasis on vegetarian dishes. Despite our limited time in Dresden, we did manage to fit in the Dresden Opera’s production of the Flying Dutchman. 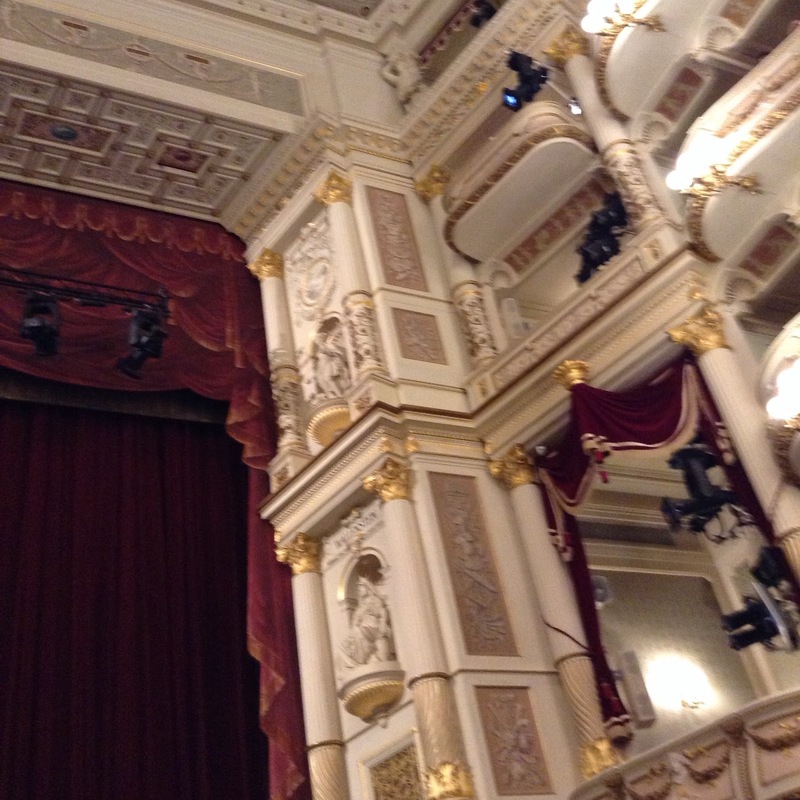 I’m no Wagner fan and wasn’t sure I wanted to do this, but Rick assured me that Dutchman is one of Wagner’s more accessible operas and the Dresden opera house one of Europe’s most beautiful, so we decided to get tickets. I’m glad we did but it didn’t change my feelings about Wagner. Sure, there was some thrilling music, impressive stagecraft and very good singers, but it was such a ridiculous story. Granted the plots of beloved Verdi operas are also ridiculous, but I’ll put up with that because I love Verdi so much. I have a lot less tolerance for Wagner’s absurd plots. Outside the opera house there was a demonstration organized by the members of the anti-immigrant group Pegida who gather every Monday to protest what they consider Germany’s too liberal immigration policies. They were a very sedate crowd; the expressions on their faces were nothing like the hate–contorted faces of photos I’ve seen of anti-immigration, Tea Party demonstrators in the US. However in the wake of the terrorist attacks in Paris the demonstrations have changed dramatically. 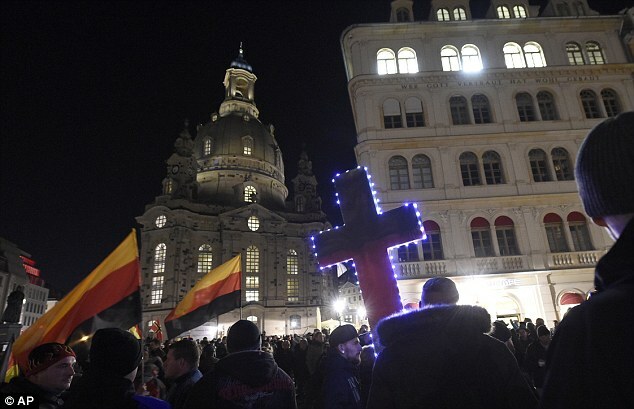 On November 16 around 8,000 people carrying gigantic crosses joined the Pegida movement for a rally in Dresden, protesting Angela Merkel's decision to allow up to one million migrants into Germany. Sure glad we weren’t in Dresden for this and happy to live in a city where although there is anti-immigrant sentiment, I can’t imagine anything like the November 16 Dresden rally in Philadelphia.